Bis-(3'-5')-cyclic dimeric adenosine monophosphate (c-di-AMP) is a bacterial second messenger implicated in the control of cell wall metabolism, osmotic stress responses and sporulation. Detection of c-di-AMP by the host cytoplasmic surveillance pathway (CSP) is known to elicit type I interferon (IFN) responses through a signaling axis that involves STING, TBK1 and IRF3 [1, 2]. Involvement of the helicase DDX41 in the recognition of c-di-AMP has been suggested . 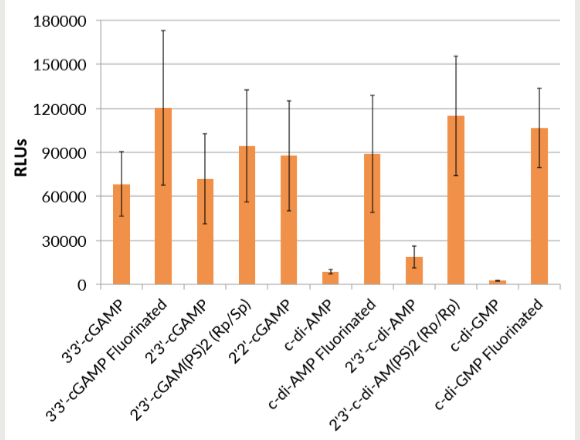 Recent studies have also demonstrated that c-di-AMP exerts strong adjuvant activities when delivered by the mucosal route [4, 5]. 1. Jin L. et al., 2011. MPYS is required for IFN response factor 3 activation and type I IFN production in the response of cultured phagocytes to bacterial second messengers cyclic-di-AMP and cyclic-di-GMP. J Immunol. 187(5):2595-601. 2. Burdette DL. et al., 2011. STING is a direct innate immune sensor of cyclic di-GMP. Nature. 478(7370):515-8. 3. Parvatiyar K. et al., 2012 The helicase DDX41 recognizes the bacterial secondary messengers cyclic di-GMP and cyclic di-AMP to activate a type I interferon immune response. Nat. Immunol. 13(12): 1155-61. 4. Ebensen T. et al., 2011. Bis-(3',5')-cyclic dimeric adenosine monophosphate: strong Th1/Th2/Th17 promoting mucosal adjuvant.Vaccine. 29(32):5210-20. 5. Škrnjug I. et al., 2014. The mucosal adjuvant cyclic di-AMP exerts immune stimulatory effects on dendritic cells and macrophages. PLoS One. 9(4):e95728. Product is sterile filtered prior to lyophilization. 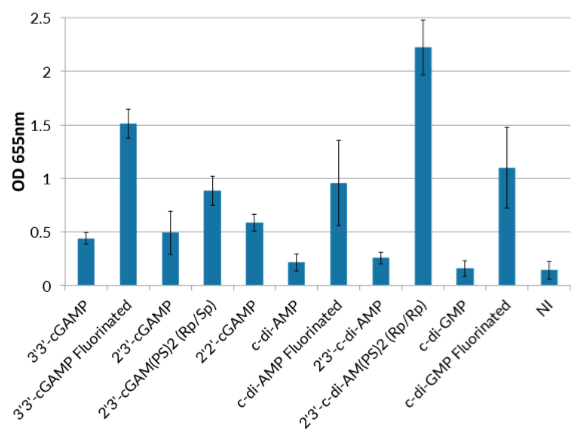 The second messenger c-di-AMP inhibits the osmolyte uptake system OpuC in Staphylococcus aureus. STING-dependent type I IFN production inhibits cell-mediated immunity to Listeria monocytogenes.